You might be wondering how to make the best-ever kale chips. No need to look any further as this is a delicious and easy kale recipe. It is a myth that the only way to make kale chips is by dehydrating kale when you can learn how to bake kale chips using an oven. 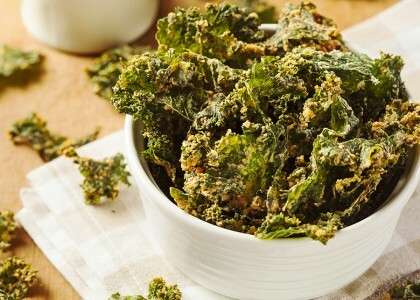 You can also learn how to make raw kale chips, and to add some spice try out this Jalapeño Cheddar Kale Chips recipe. Clean kale thoroughly and remove the curly kale from the stems; throw the stems away. 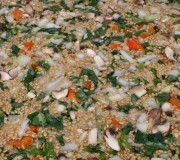 Place kale leaves in a large bowl and set aside. Put all remaining ingredients in a high powered blender such as a Vitamix machine. Start the blender on low speed, gradually increasing to the highest speed. Blend well to a smooth consistency. Add extra water, lemon, oil, and salt as needed until it becomes the perfect flavor and texture for you. Using gloves, pour the mixture on top of the kale. Massage the mixture into the kale until it is fully covered in the sauce. If you are using an oven: Preheat oven to 250 degrees. Put kale on baking sheets and place in the oven for approximately 30 minutes. Bake until the chips are crispy. If using a dehydrator: Place prepared kale on Teflex sheets and put into the dehydrator. Leave at 115 degrees for approximately 8 hours or until kale is completely crisp. These Jalapeno Cheddar Kale Chips taste similar to regular spicy chips but are lighter in texture. The sunflower seed cheese sauce has a cheddar flavor, and the jalapeño gives it a little kick. It’s the perfect amount of heat that puts a smile on your face, making you want to eat more! 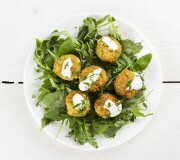 Baked Falafel Balls are delightful and filling, wholesome and full of great nutrition. 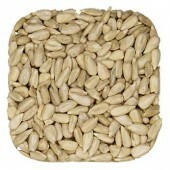 Eaten in pita bread or as a salad, they go excellent with some chopped tomatoes and romaine lettuce. If you also use our Creamy Cashew Tahini Dressing, you are guaranteed a healthy falafel recipe. Who would have ever guessed that you can make raw food pizza?! Guilt free pizza sounds like something unimaginable, but when it comes to eating raw foods such as this raw food pizza, you can be confident in knowing that you are eating guilt free pizza. If you are vegetarian and like asian cuisine, you won't want to miss out on this delicious dish. 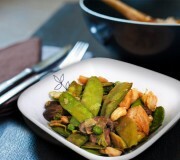 There are many vegetable stir fry recipes out there but few are as easy and healthy as this quick stir fry.